Who is he, and what's he from? we loves the cupcake like the debt rock loves it LOADS lavi's birthday is near mine i didn't know that YAY!!! I like the texture on his shirt and headband. That is so awesome. Absolutely adorable. 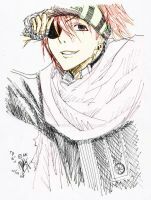 okay i didnt make it this year either..
lavi is such a dude, great job! You could ask Lenap too. Amazing job with the anatomy and I LOVE HIS HANDS & FACE. He's not Kakashi, is he? makes you want to steal the small cupcake out of his hand.